A President is more than just an executive position. 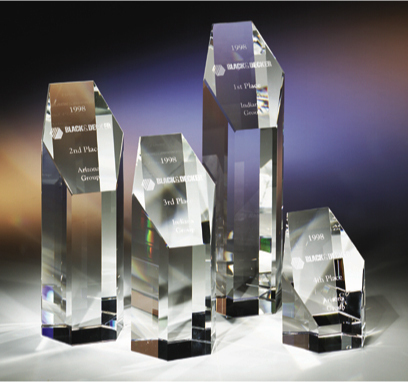 And this stunning crystal award from CRYSTAL WORLD® is not only for presidents. Like a president, any effective leader in sales, business, government, sports or entertainment leads and inspires by example. "President" will make an ideal executive gift, recognition or achievement award and yes, a great "President's Award." Each 5-sided crystal tower features a beautifully polished, pentagon- shaped slanted surface, perfect for etching. Recommended Bases: SP712A or B, SP812, SP912. 2 1/2" x 2 1/8" x 3 1/4"
Ship Weight: 1 lb. 4 oz. Etching Area: 1 5/8" x 1 5/8"